The Down Town Club Philadelphia wedding receptions are always spectacular. Thanks to the Cescaphe's extended cocktail hour at all their venues, we always have a chance to spend some time to sneak into the empty reception room and photograph all the beautiful decor that the creative team put together. When photographing the wedding reception decor we always look for the various angles and perspectives to shoot. In order to render the atmosphere and the original look of the space, we almost never use any external light to lit the scene. The candle lit receptions are probably one of my favorites. The candle light produces a delicate soft light which reflects in a beautiful way on the glassware. When shooting from the distance and zooming in, the candles do create some remarkable bokeh in the background, looking like thousands of glitters shining around. This photograph was taken at one of the wedding receptions that we photographed at the Down Town Club. The table decor and the florals were designed by the extraordinary Honeybunches Floral team. 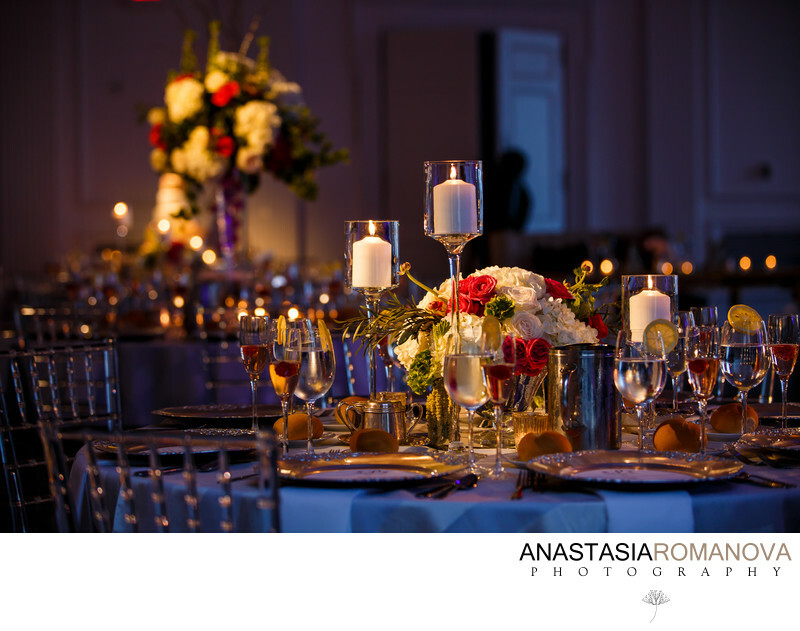 I especially loved the combination of the high and low centerpieces and the way they were lit by the venue's spot lights. After we were done with photographing all the reception details, we still had 15 minutes left to photograph the bride and groom in the empty reception room as well, which is always a huge benefit. Canon 5D mark III, ISO 500, 85mm; f/2.8; 1/60 sec.